Catladyland: Cats are Funny: Is Your Cat a Pawla Deen? Is Your Cat a Pawla Deen? Today, we are flashing back to a Friday Fanglish cat slang favorite. Do you have a Pawla Deen? I do -- and her name is Saffy. 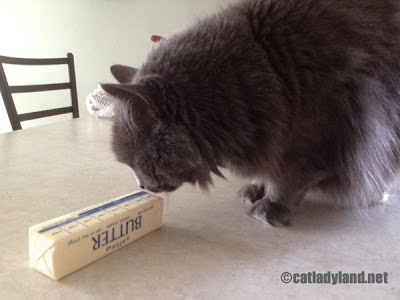 A cat who jumps on the counter to lick a stick of butter. Maurice was glad The Lady made pancakes this morning because, when she wasn't looking, he could be a total Pawla Deen. See you next week for two brand new terms from the back alley world of Fanglish!